Describing Phyllis Wildenstein, her daughter, Aleta, starts with one word: stubborn. At 95 years old, Phyllis refuses to slow down. She's been sewing and embroidering since she was a child, but only started working with Aleta on quilts a few years ago. Watching television in her St. Helens home, Phyllis saw an applique quilt featured on a program. "I can do that," she thought. "She did everything wrong there was to be done wrong if you're a quilting purist," Aleta said. 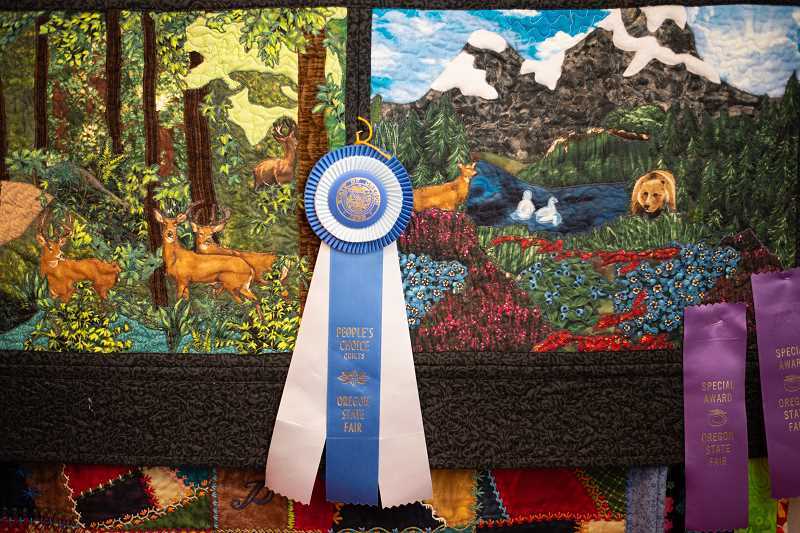 But Phyllis' quilt earned multiple ribbons at the Oregon State Fair, including the People's Choice Award. 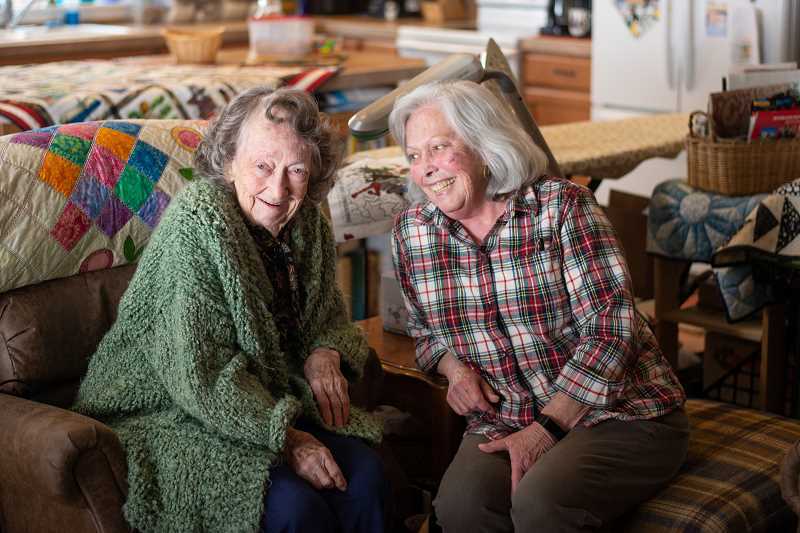 Over the past few years, Phyllis and Aleta have done countless projects, ranging from massive applique quilts to pot holders and wall hangings. Their work fills shelves, tables and walls, with award ribbons pinned to many pieces. 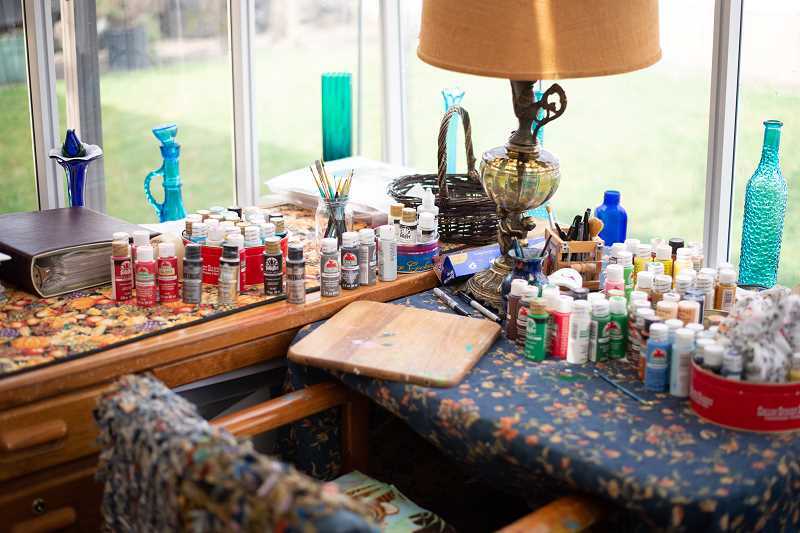 Despite arthritis and limited mobility, Phyllis continues to embroider and paint. Stitch by stitch, Phyllis works away at projects that often take months or even years to complete. "She's not fast, but she keeps moving," said Wes Hanson, minister at Scappoose Church of Christ, where some of Phyllis' quilts hang. "I think that's really inspirational on its own." Phyllis "is just somebody who refuses to quit doing good," Anderson said. Aleta has been quilting for more than a decade, recently making quilts for hospital patients and kids at her church when they graduate high school. Then Phyllis and Aleta started making pot holders. Using coloring book pages by Matthew Ebisch and other artists, the pair trace the illustrations and then Phyllis embroiders over the lines. Using the embroidered outline as a guide, Phyllis paints the drawings in vibrant colors. Finally, Aleta finishes off the squares. They've made pot holders as birthday presents for all the women at their church. "Before we ever finish anything, there are a dozen things people want us to do," Phyllis said, illustrated by the in-progress projects filling the house. "Mom likes to give things away," Aleta said. "And heaven knows you wouldn't be able to walk in this house if we didn't give stuff away." "They just pay attention and if somebody mentions someone who could need a quilt, they just go for it," said Hanson. The quilts provide comfort and support for first responders, cancer patients, graduates and others. The quilts, Hansons said, are like "a wrap-around hug." At their church, quilts made by Phyllis and Aleta offer bright pops of color and teach children about the Bible. 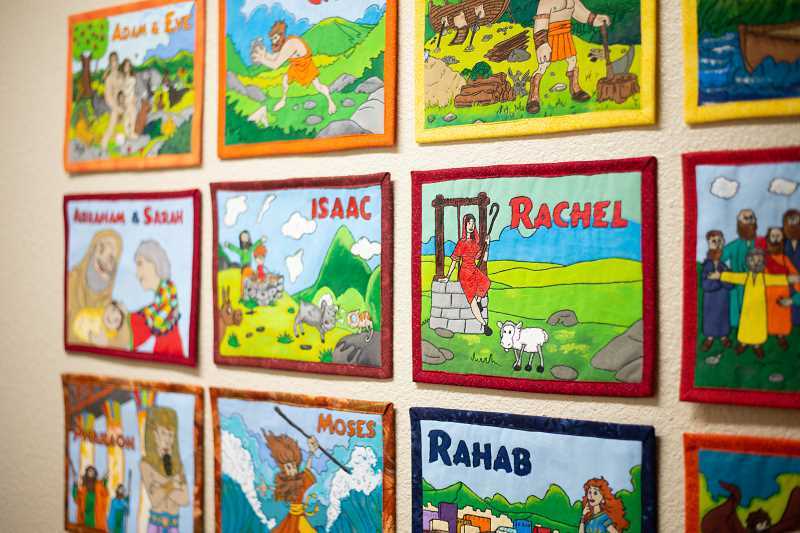 One project hanging in the church hallway consists of individuals panels depicting biblical characters. The quilt is made to be used in classes; each panel is attached to the wall with Velcro and includes a Scripture citation on the back side. Ebisch said he felt honored when Aleta reached out to share what she and her mother had created. " I was happy to hear [Aleta's] aged mother was getting purpose and enjoyment out of using my coloring pages, as my own mother died at 62 and never even got to see my Heroes of the Bible coloring pages," Ebisch noted in an email. Growing up during the Depression, "people didn't have any money, they didn't have anything," Phyllis said. "If you wanted something, you made it. So the women got together with their scraps and put everything together and pieced them by hand. I've been doing this all my life. And then I taught my children to work. When they were tiny, and Aleta still in diapers, she was learning how to take a needle and poke it up and poke it down. I was trained when I was tiny and I trained my children." "In those days we didn't feel like we were poor. Everybody else didn't have any money either. But you would do with what you had and make it work. That's the thing. Use what you have and make it work," said Phyllis. "I have problems with my legs, with standing up. But I'm going to grow a tomato this year or die trying." Other lessons from Phyllis' 95 years have shone through to her life today. "We've traveled to every state west of the Mississippi and done more, seen more, than most people have done in a long time," Aleta said of her childhood with Phyllis. "We didn't have a lot of money but we did a lot of things that didn't cost money," added Phyllis, describing fashioning a bed out of clothes in the backseat of the family car rather than paying for motel rooms, cereal for every meal on road trips, and close calls with broken down cars. "We would go just as far as half our money would take us. When we spent all our money, we'd turn around and go back. And always reserve a dime for a phone call in case you need help." "With that kind of a background, you can see how we can work together," Phyllis said. And the two do work well together. Phyllis embroiders and paints, Aleta quilts, but the design is a constant back-and-forth. "We're together all the time," Aleta said. "Just bouncing stuff off each other." The two moved to St. Helens almost two decades ago, and have since filled their home with quilts. "You see, Aleta and I don't have to have anything to make us happy. We have each other," Phyllis said. "But we make these for people. It's such a little thing, but when you use it, you'll remember us. You'll remember that old lady and her daughter." "We do it because we're selfish," said Aleta. "Because we love to see the joy on people's faces when they get it. Like the mini quilts on the church wall. How better to glorify God than with something you really like doing?"